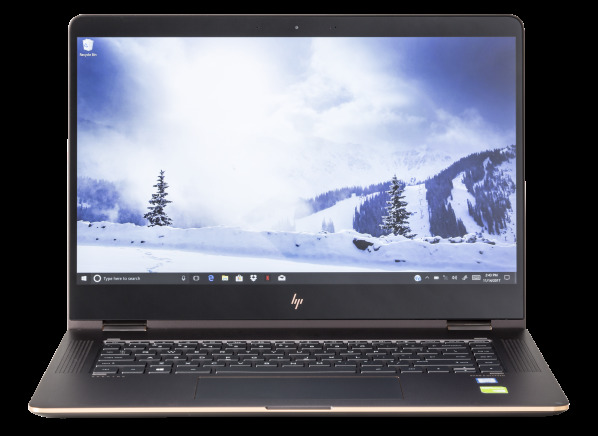 A 15.6-inch convertible laptop tested with Windows 10 Home, an Intel Core i7-8550U 1.8GHz processor, 16GB of memory, Nvidia GeForce MX150/Intel UHD Graphics 620 graphics, a touchscreen, and a 512GB solid state drive. The HP Spectre 15-BL112DX x360 is a 15.6-inch convertible laptop with a screen resolution of 3840 x 2160. It has 16GB of memory and a 512GB solid state drive. It has an Intel Core i7-8550U 1.8GHz processor and Nvidia GeForce MX150/Intel UHD Graphics 620 video adapter with 2048MB video memory. But it lacks an optical drive for burning CDs or DVDs. It was tested with Windows 10 Home installed. The Spectre 15-BL112DX x360 has an SD memory card reader for digital photography, a touch screen, and 1 full-size, 2 type-C USB ports built-in on the laptop. However, you'll lose a USB port to plug in the power cable when charging the laptop. It has HDMI out for connecting to an HDTV. You can connect to the internet using an 802.11n router, which uses an older WiFi standard, or an 802.11ac router, which has the latest, faster WiFi standard. The Spectre 15-BL112DX x360 measures 14.3 inches wide by 0.7 inches high by 9.9 inches deep and it weighs 4.5lbs. It's backed by a 12 month warranty, with 12 months of free tech support by telephone.